The current dare over at DCM this week is All about Me - to make a card you'd like to receive. Well my card had to use papers and an image from Pink Petticoat, they've always been a favourite with me. It had to be this semi circle shape too! It's always the shape I go for when I'm struggling with my mojo, ever since I made the first one back HERE last year. I find it an easier shape to work with than a whole circle or a square. 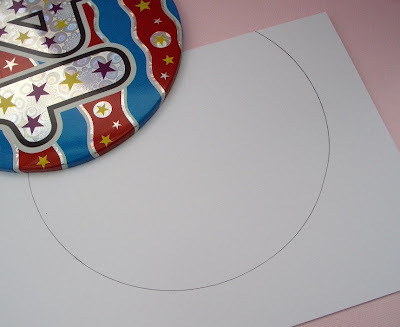 It's easy to make too, no fancy templates or circle cutters required. Just take an A4 sheet of cardstock and fold in half . Use anything circular to draw around, I use this oversized badge, it's about 15cm in diameter. Then cut out - simples! Gorgeous card Vicky, really love the shape and design. Vicky your card is sooooo lovely - thank you for playing along with The Daring Cardmakers this week, it's always fab to see you! 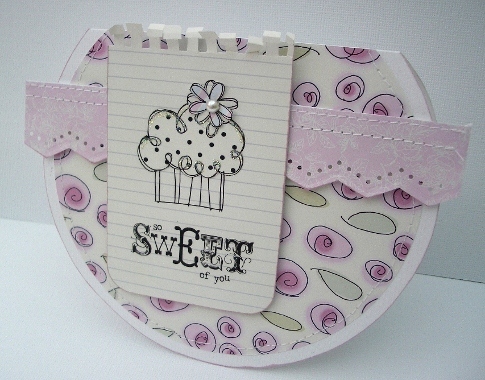 This is such a fabulous shape for a card and so easy to make - love the papers and the 'sweet' image too. Thanks for joining in with us at DCM this week. I love this card - the shape, colour combination and the image are so great :) Thank you for joining Daring Cardmakers this week!